I have to admit that out of the leading major social networking sites, I’m the least active on LinkedIn. It simply doesn’t offer me the same personal social experience as in Facebook, Twitter and even neither as in Google+. However, LinkedIn does has a great daily personal news section called LinkedIn Today which I occasionally visits. It is providing the top news from the web especially personalized for the user based on his/her connections’ sharing and trending contents from industries the user follows. It resembles Twitter’s revamped Discover tab, only it’s better. 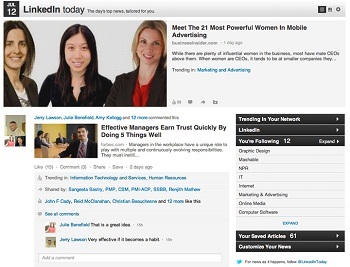 And lately, the social networking company went the extra mile to improve LinkedIn Today even more. On Friday, LinkedIn’s head of content products Ryan Roslansky posted on the company’s blog that two new features have been added to LinkedIn Today, which designated to increase the level of users’ interaction with the product’s contents by using new social elements. Like and Comment- Besides sharing contents from the web, liking and commenting on contents are ones of the core social networking attributes. Now, LinkedIn finally brings those attributes into LinkedIn Today which will offer another layer of discussion around shared pieces of contents. But while liking a post on LinkedIn Today is rather easy by simply clicking on a thumbs up icon, commenting is a bit more clumsy and requires jumping between pages. At first you need to click on the comment icon and only after you’re being redirected to another page you can see the full discussion and comment yourself. When the discussion isn’t an integral seamless part of the post, it will surely have a negative impact on the users’ engagement. That’s a shame because LinkedIn can certainly benefit more interaction from the users if it will just make the discussion more attachable to the post. “Trending In Your Network” Tab- LinkedIn also added a new tab to LinkedIn Today that can sort the most sharable and liked posts within the user’s network only, meaning from the first circle of connections alone and NOT based on an industry or up to third circle of connections as in LinkedIn Today’s homepage. This is really a fantastic new filtering feature which can help users to genuinely find what are the current most popular posts among their direct connections. Tailored news on its best, indeed.